You’re a Manager!… Now What? Congrats: you are now a manager in government. Wondering what to do now? You’re not alone. Most first-time managers inherit their teams. In a session at the Next Generation of Government Training Summit, speaker Jon Haverly of the Wiseman Group helped guide the audience through navigation of the many roles a first-time manager has to learn to play. The most important thing for new managers to overcome, Haverly said? 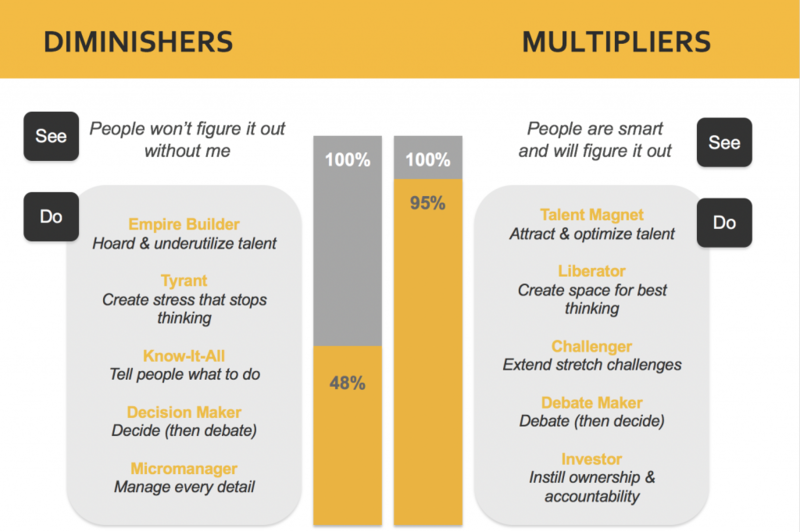 The path to becoming a multiplier. Multipliers are leaders who fully utilize and amplify the smarts and capabilities of the people around them. Becoming a true multiplier can be hard for new managers, particularly because they were probably high-performing individual contributions beforehand, and are used to advancing their own particular skills and ideas, and not empowering others necessarily. A successful transition from an individual contributor to a multiplier leader begin with a critical shift in mindset. Once you become a leader the success of the team far outweighs any individual contribution that you can make. As a leader, you provide more value to your agency through facilitating the success and growth of your team as opposed to continuing to focus on your own ideas and contributions. For many new, and experienced, leaders this can be a challenging transition. What can be even more damaging for new managers than not being a multiplier is sliding into the path of a diminisher. Diminishers deplete their organization of engagement, morale and crucial intelligence and capability. So how can new managers make sure they get on the right path to being a multiplier that can lead, accelerate, and inspire their team to get more done with less? How deeply am I utilizing the talent of others? Am I tapping into the greatest number of brains? How can I improve services with the resources I already have? It’s also important you don’t fall into what Haverly called “accidental diminishers” – folks who diminish even though they have the best of intentions. Well, you may think you’re an idea guy, but it could be distracting your team. Maybe you like rescuing people, but you could be preventing their growth. You might think of yourself as the Energizer Bunny, but your team could be totally drained. Perhaps you jump in at every opportunity to do what you see as protecting teammates – but as a result, they feel totally and utterly siloed from everything and everyone. Ask more questions. The best leaders have the right questions, not the right answers. Play fewer chips in a meeting. Pick a meeting where you have a tendency to overcontribute. Give yourself a budget of “poker chips,” with each chip representing a comment or contribution to the meeting. Maybe it is 5 chips, and maybe just 1 or 2 chips. Use them wisely, and leave the rest of the space for others to contribute. Name the genius. Identify the native genius of each person on your team. Find the native genius of individuals on your team and find novel ways to utilize their genius more fully. Do this individually or as a team so that everyone understands the native genius of each person on the team. Hold a debate on a key issue. Use debate to build the collective intelligence and the will needed to execute fast and flawlessly. Identify an important decision and frame the issue to your team, ask them to prepare by coming into the debate with a) data and b) an opening position. Then spark the debate and drive a sound decision. Give ownership back to the person it belongs to. When someone brings you a problem that you think they are capable of solving, give it back to them and ask for the “F-I-X.” You play the role of coach rather than problem solver. If someone legitimately needs help, jump in (take “the pen”) and contribute, but then clearly give ownership (“the pen”) back. Give someone a job that is a size too big. Acknowledge that everyone on your team is at different capability levels. But, everyone is capable of growth. Carve out roles and responsibilities the way you shop for shoes for pre-schoolers…one size too big. And then let the person grow into their new responsibilities. By trying these tactics, and shifting your concept of what a leader should be, you’ll become a leader who uses their smarts to make everyone around them smarter and more capable. You’ll become a multiplier.